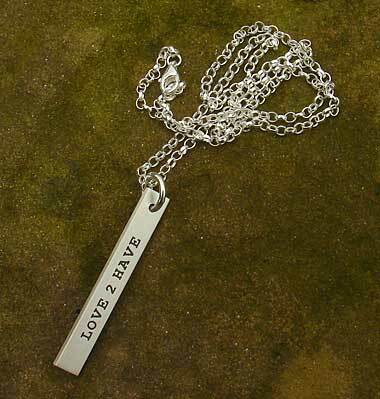 Women's Personalised Necklace : LOVE2HAVE in the UK! 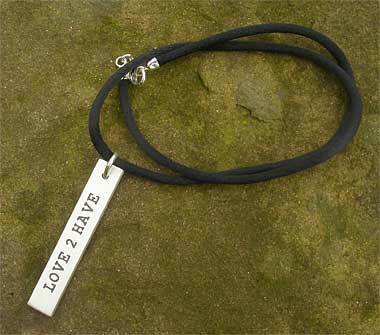 A women's personalised necklace. 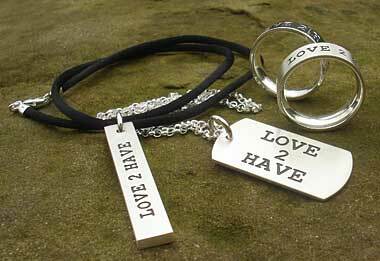 Along time ago when we first started our business, we used to sell a lovely range of solid silver personalised jewellery for men. We are pleased to announce that we have resurrected this collection and they are back now for you to purchase even better than ever! The group is made up of some rings, necklaces and a dog tag and they all look stunning with their deep engraving. 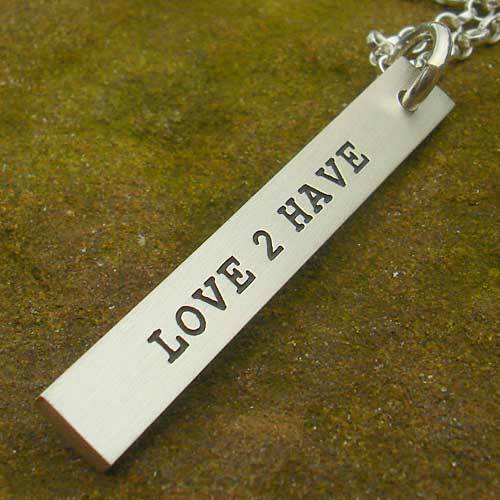 From the solid silver personalised jewellery range here we have the women's necklace measuring 6mm in width by 45mm high. The silver is a 2mm thick slabbed squared off piece attached to a silver jump bead that comes threaded onto either a black cord or a silver chain, both of which are 16 inches in length. The silver has a lovely steely finish to it. Other sizes are also available, so please email for details. Enter whether you prefer the cord or silver chain into the comments box at check out. The engraving sits centrally on the outer created with laser technology. We like the example with our name on it as it comes in a Typewriter style font which gives the piece a slightly grungy or street look. Being very dark the engraving is very clear to see and looks fabulous against the entirely different steel silver finish. Pictured on this page is the pendant on its silver chain but we also have an image of the larger one we do on the back cord. The personalised engraving included in the price is FREE! Enter your requirements into the comments box at check out. The design covers any free font, with any amount of text, but do bear in mind the limited space with items such as this.